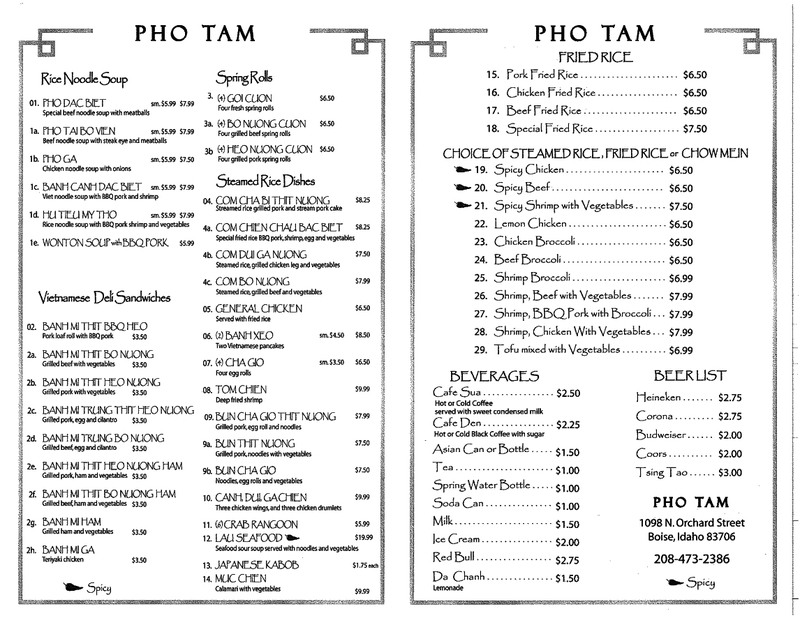 I've mentioned it once or twice over the past few weeks, but a Vietnamese eatery called Pho Tam has recently taken over the spot vacated by Chef Express just south of Golden Star on Orchard in Boise. 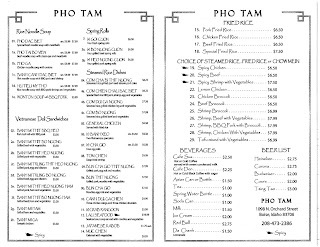 I have almost no experience with Vietnamese food other than the sandwiches and spring rolls at Baguette Deli (previous write-ups here), the only other Vietnamese restaurant I've ever eaten at being the now defunct Saigon Grill. So, I was excited about the prospect of a pho joint opening so close to my office and have driven by about three times a week hoping to see an "open" sign. This week, it finally happened. 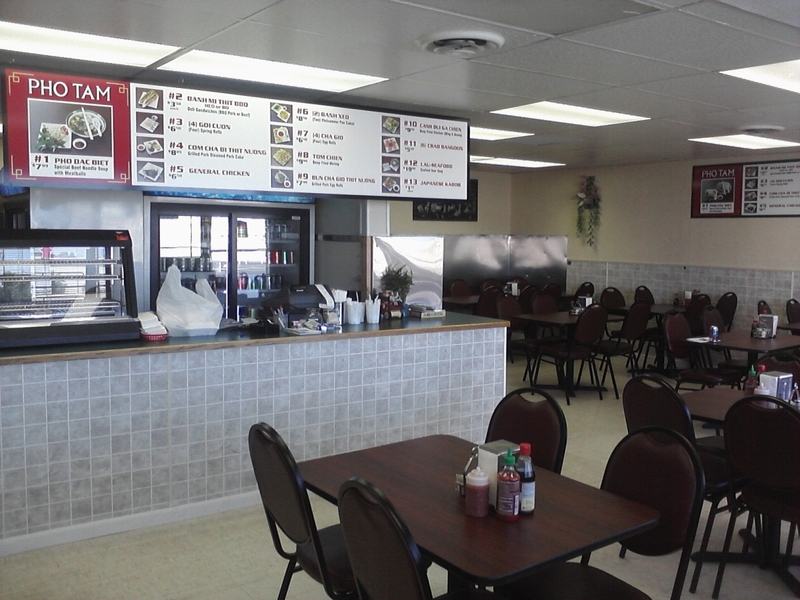 I never ate at this place when it was Chef Express, and I wasn't about to make the same mistake again. I have to admit that I was expecting a little hole in the wall place with little (if any) seating, but pho has never struck me as something that would make for good take-out, and given the sign advertising pho (specifically beef noodle) I was guessing that was the main thrust of the business. Once through the door, I knew immediately that I had been wrong about the place itself. Though furnished in a rather utilitarian style, there was still quite a bit of seating, and a glance at the menu above the counter showed several options including some Chinese fare. At least I had been right about the limited menu, I thought to myself. And while I thought over the 13 simple choices before me and marvelled at some of the prices ($6.50 for four egg rolls seems steep, especially since you can get them a few blocks up the street for eighty-five cents a pop, and don't even get me started on crab rangoon at a buck a piece) when the woman at the counter pointed out to me that the sign I was contemplating was just the highlights. She handed me a to-go menu that would ultimately result in my being late getting back to work due to the number of tantalizing and unfamiliar choices. Sorry, the restaurant doesn't give out the nifty plastic chopsticks, those are mine. Before I risked setting my mouth on fire, I decided to try the egg rolls. I knew going into it that they were different than Baguette Deli's for the price and the fact that they had been cooked when I ordered them rather than being held under a lamp. That being said, Baguette Deli still has the better flavor, with a high concentration of veggies and noodles while these were mostly ground pork. Dipping them in the fish sauce helped immensely though, so maybe that's why it was included. I might still have to try the grilled pork ones, I think that's the type Baguette Deli makes, but Pho Tam didn't have those available in a half order. Back to the soup. My only other pho experience had been at the aforementioned Saigon Grill. I had been confused and unable to make the soup taste good. Eventually I ended up ruining it with too much cilantro and Sriracha. Still, Bourdain and just about every other Asian food freak loves the stuff, so I was determined to give it another chance, and Pho Tam didn't disappoint. The heat built slowly enough that I was able to acclamate, and between all the different ingredients no two bites tasted the same. One minute it was all onion, the next basil, then chicken, cilantro, chili, and endless overlapping combinations. I wanted to go on tasting that variety long after my system had forced me to stop shovelling it into my face. They gave me two, so I opened two! There are a lot of other things on that menu I want to try. I can only hope they review their pricing structure down the line, because there are selections I will avoid at this point just because I know I can get them somewhere else considerably cheaper. They also have the cheap banh mi sandwiches, which along with Baguette Deli and Chau's makes three places I can get them and still be back to work on time. I only hope that all of the places springing up to sell them are because the market demands it and can support all the options, because I really don't want to lose any of them. A good new restaurant always makes me happy. If it's Asian, that makes me even happier. And when they're open seven days a week, including being open until 2 AM on weekends like Pho Tam, that has the makings of an invaluable community resource. I've been at Pho Tam twice in as many days, and enjoyed the hell out of it both times. Let me know next time you plan on heading over there on an evening or a weekend, maybe we can get together and catch up. I've been digging your food writing of late. Whoa, that's odd, that came up under my Twitter user name. Darrin here. Sad when you use catching up with a friend you haven't seen in almost a decade as an excuse to go out for Asian food. But what the hell, it works for me! I'll be in touch. I finally hit up Pho Tam today. Based on this post, I didn't realize that it had been there for so long. I picked up the number 1, and they were kind enough to half an order of grilled pork spring rolls for me. The Pho was dynamite. These folks have mastered the art of Pho to go. Assembling it at home was a fun little ritual in itself. I added extra srirachi for a little more kick. The only other Pho I've had in Boise was at Pho Nouveau. This was at least as good, if not better. There was a little bit of clumped noodles at the bottom, but that is probably a factor of the massive amount of noodles they include in the first place. This was a hearty, savory dish. The spring rolls were delicious, but I prefer a lighter peanut sauce. I think the best spring rolls in town are still at Chiang Mai. However, I think these beat the ones at Baguette, probably because they were made to order. I will definitely be back to Pho Tam soon.